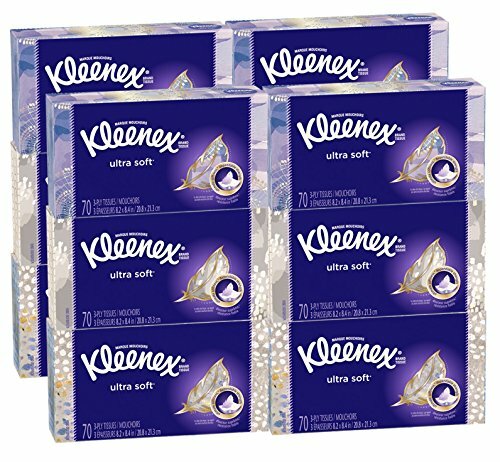 Kleenex Ultra Soft & Strong Facial Tissues, 70 Tissues per Flat Box (12 count) by Kleenex at Enria Industries. MPN: 10036000478683. Hurry! Limited time offer. Offer valid only while supplies last. One soft tissue is all it takes to show you care. Reach for gentle, indulgently soft Kleenex Ultra Soft Tissues for a friend, a stranger or yourself. One soft tissue is all it takes to show you care. Reach for gentle, indulgently soft Kleenex Ultra Soft Tissues for a friend, a stranger or yourself. With the perfect balance of softness and strength, Kleenex facial tissues are durable with 3-ply thickness and are absorbent to lock in moisture. Ultra Soft facial tissues are perfect for makeup smudges, sniffles and sneezes, children's messy faces and more. Just use and toss. Stock up and save on Kleenex Ultra Soft & Strong Tissues with Subscribe & Save and keep tissues on hand to care for family, company and yourself during cold and flu season, allergy season, back-to-school and holidays. And as always, Kleenex boxes come in a variety of colors and designs that blend beautifully into your home decor. Place boxes in the living room, kitchen, bathrooms, bedrooms and office. Kleenex disposable facial tissues have been there for happy tears and stuffy noses since 1924.